The red dress is back! Reba McEntire rocked a sheer, sequined red dress as she hosted the Academy of Country Music Awards on Sunday. Besides being gorgeous, the dress also looked very familiar. 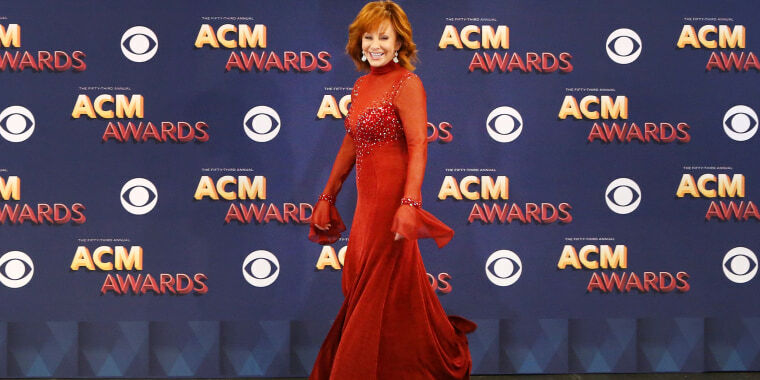 As long-time Reba fans were quick to point out, she wore the same gown to the 1993 Country Music Association Awards! With its sheer, plunging neckline, the dress made headlines when the country star first wore it during a duet of “Does He Love You?” with Linda Davis. Since then, the gown has become something of a country music legend. It was once exhibited at the Country Music Hall of Fame and Museum, and it even has its own Wikipedia page. McEntire, 63, celebrated the return of “THE red dress” on Instagram. The country superstar loved the dress so much (and who can blame her?) that she also wore it during a performance in San Jose, California, in 1994. McEntire looked as stunning as ever as she brought back the iconic gown for a performance of “Does He Love You?” at the 2018 ACMs, this time singing with daughter-in-law, Kelly Clarkson. Before the show, she joked around in the press room and showed off her matching red slippers. But once she got on stage, she was all business in the famous, fiery red gown. All hail the Queen of Country!